Close on the heels of its re-organisation, Spice Group company Spice Online Retail Pvt Ltd has launched an e-commerce portal Saholic.com. 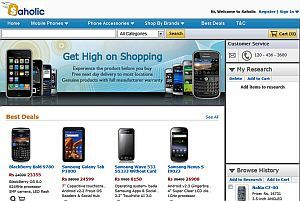 Saholic.com is an online shop for handsets and mobile accessories and retails not just Spice handsets but other brands such as Samsung, Nokia, Blackberry and Sony Ericsson too. The company promises free 'next day' delivery and the products offered will have manufacturer's warranty. It also shows a customised Research tab and a Browse History tab on the right hand column so shoppers can keep track of handsets in which they are interested. It also features a Best Deals section, but how will the company fare when there is a gamut of online gadget shopping sites that already exist? Consumer electronics is one of the fastest growing e-commerce categories. Sites such as Letsbuy.com, Buytheprice.com and Gadgetsguru.com are aggressively scaling up to cater to growing demand. Future Group's FutureBazaar.com relaunched its website with massive discounts and Tata Group's retail arm Infiniti Retail is also readying to launch an e-commerce enabled version of its website Cromaretail.com this month. Infiniti Retail operates Croma, the consumer electronics chain that sells 6,000 products and 180 brands in categories such as home entertainment, small appliances, white goods, computers, communication, music, imaging and gaming software. Group buying sites are also venturing into gadgets with Groupon India, Snapdeal.com, Naaptol.com, Flipkart.com, Infibeam.com, eBay India and Indiaplaza.in. Besides Spice Online Retail Pvt Ltd, the group operates Spice Retail, Spice Mobility, Spice BPO, Spice Digital and Spice Labs. The group announced it is remodeling itself as a technology company and will create an umbrella brand for its associate companies and subsidiaries in Africa's Ivory Coast, Middle East, India and S.E.Asia. It also announced plans to invest Rs. 1000 crore in FY2011 and increase focus on local handset distribution. Its handset manufacturing division Spice Devices will focus on seven clusters across the country. Spice Mobility recently launched dual sim and Android OS based handsets in India. It also appears to have a 7 inch tablet called CSL Droidpad Mi700. Mobile application developer Spice Labs registered a total of 10 million downloads on the Blackberry application store.